A hybrid is any vehicle which uses two (2) or more sources of power. Examples could be Mopeds, Locomotives, submarines, etc. 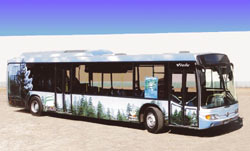 Hybrid cars are also an example, using both gasoline and electric power. Hybrid electric vehicles (HEVs) combine the internal combustion engine of a conventional vehicle with the battery and electric motor of an electric vehicle, resulting in twice the fuel economy of conventional vehicles. This combination offers the extended range and ability to refuel that consumers expect from a conventional vehicle, with the energy and environmental benefits of an electric vehicle. In addition to combining types of power, hybrid car engines are also built smaller to accommodate the ninety-nine percent (99%) of the time when the car is not going uphill or accelerating quickly. It uses the battery to provide extra acceleration when needed and when stopped, the gas motor shuts off runs on the electric and battery. The practical benefits of HEVs include improved fuel economy and lower emissions compared to typical vehicles. The new flexibility of HEVs will allow them to be used in a wide range of applications, from personal transportation to commercial hauling. Hybrid power systems were developed as a way to compensate for the downfalls of battery technology. Because batteries could supply only enough energy for short trips, an onboard generator, powered by an internal combustion engine, could be installed and used for longer trips. In the old days, we thought that by creating a system using battery-electric power and operating on wall-plug electricity as much as possible, efficiency and emissions would then be about as optimal as we could hope for until better batteries came along. The natural conclusion of this concept was that, with better batteries, we probably would not need hybrids at all. But after 20 years of study, it seems that hybrids are taking center stage and solely electric vehicles are only being used in niche market applications where fewer miles are traveled. More efficient cars can make a big difference to society in terms of environmental benefits, and the serious deterioration of urban air has motivated regulators to require cleaner cars. The use of HEVs will reduce smog-forming pollutants over the current national average. Hybrids will never be true zero-emission vehicles, however, because of their internal combustion engine. But, current hybrids on the market will cut emissions of global-warming pollutants by a third to a half, and later models may cut emissions by even more. What are the components of a hybrid car? Gasoline engine - The hybrid car has a gasoline engine much like the one you will find on most cars. However, the engine on a hybrid is smaller and uses advanced technologies to reduce emissions and increase efficiency. Fuel tank - The fuel tank in a hybrid is the energy storage device for the gasoline engine. Gasoline has a much higher energy density than batteries do. For example, it takes about 1,000 pounds of batteries to store as much energy as 1 gallon (7 pounds) of gasoline. Electric motor - The electric motor on a hybrid car is very sophisticated. Advanced electronics allow it to act as a motor as well as a generator. For example, when it needs to, it can draw energy from the batteries to accelerate the car. But acting as a generator, it can slow the car down and return energy to the batteries. Generator - The generator is similar to an electric motor, but it acts only to produce electrical power. Batteries - The batteries in a hybrid car are the energy storage device for the electric motor. Unlike the gasoline in the fuel tank, which can only power the gasoline engine, the electric motor on a hybrid car can put energy into the batteries as well as draw energy from them. Transmission - The transmission on a hybrid car performs the same basic function as the transmission on a conventional car. Some hybrids, like the Honda Insight, have conventional transmissions. 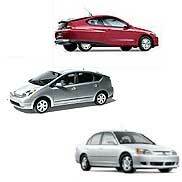 Others, like the Toyota Prius, have radically different ones. 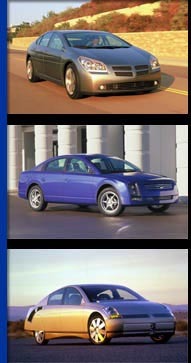 There are obvious benefits to the production of hybrid cars. Due to the decreased dependency on gasoline, gas mileage is greatly improved, especially in comparison to the gas-guzzling SUVs currently found in abundance. 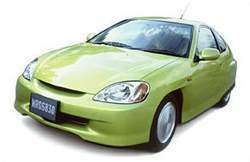 Cars such as the Honda Insight can get upwards of 65 miles per gallon, depending on the measures one takes to conserve fuel. In addition to the engine's capability to use electric there are other measures a driver can take to limit gas usage, such as not accelerating quickly (you're not going to beat anyone in a race anyway), slowly coming to stops in order to recapture breaking energy, or using high octane gasoline. Also, some places, namely California, have instituted tax benefits and refunds through implementations such as the Clean Air Act. Refunds can be up to $2000. And, the main reason these refunds are given is because of the environmental benefits, harmful car emissions are decreased immensely. Smog forming pollutants are cut by 90% and Carbon Dioxide emissions are cut almost in half. Also, hybrid electric vehicles decrease fossil fuel dependency, meaning alternative fuels can now be used. 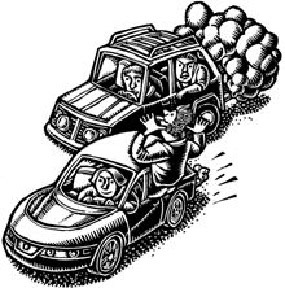 More vehicular benefits are the ability to have regenerative braking, smaller engines, and lighter vehicles. Regenerative braking allows the vehicle to minimize energy loss and recover the energy used to slow down or stop. Engines are sized to reflect average load and not peak load, and special lightweight materials are being used. Combined, these benefits mean a more eco-friendly, aerodynamic, and state-of-the-art car. Hybrid vehicles are better for the environment, ride quietly, and can save you significant fuel expenses. They tend to be $1,500 - $2,000 more expensive upfront and many locations have a several month waiting period for a new one. Yet, in California, you can get a tax refund that will reimburse you for the $1,000 to $2,000 cost. While, hybrid cars may not be nearly as powerful (and arguably as stylish) as the sportier cars found today, there are obvious benefits. But, the cars should get better as the government takes a more proactive role in working with car manufactures to design and build hybrid vehicles and as more manufactures take part. Honda has already produced both the Honda Civic and Honda Insight, Toyota makes the Prius, by 2005 Ford will have the first hybrid SUV (The Escape), by 2007 General Motors hopes to have a full line of vehicle types, and even Lexus and Daimler-Chrysler have vehicles coming out soon. While, its impossible to know whether or not hybrids will become completely mainstreamed, great strides are being taken to produce more "user-friendly" versions. Currently only available with small four-cylinder engines, manufactures are making larger, more powerful engines; although gas mileage and subsequent emission benefits will be decreased somewhat. Hydrogen power, and other new sources could be implemented soon as well. And, the cars should become more affordable and more easily fixed every year as we improve upon this new technology. Should you get a Hybrid? Well, that's entirely dependent on how eco-healthy you're attempting to be. However, even if you don't purchase your own, they could find their way into Public Transportation very soon. In Mexico, regularly circulating buses and already be found.